So far, most of the narratives which I have analysed in detail have been relatively simple, and with the exception of some of the moral tales of Hogarth and others, expressible in a single painting. I turn now to a long and complex narrative, that of Perseus and Andromeda, which formed the basis for an extraordinary series of narrative paintings by Sir Edward Coley Burne-Jones (1833-98). I had originally hoped to confine this to a single article, but it is far too complex for that: this article will examine the narrative, the origin of Burne-Jones’ Perseus series, and some other depictions of parts of the story. The next will step through the paintings in the Perseus series itself. Arthur Balfour (1848-1930), then a young Conservative MP in the UK House of Commons but destined to become Prime Minister, decided to commission a series of narrative paintings to be shown on the walls of the drawing room of his London residence. 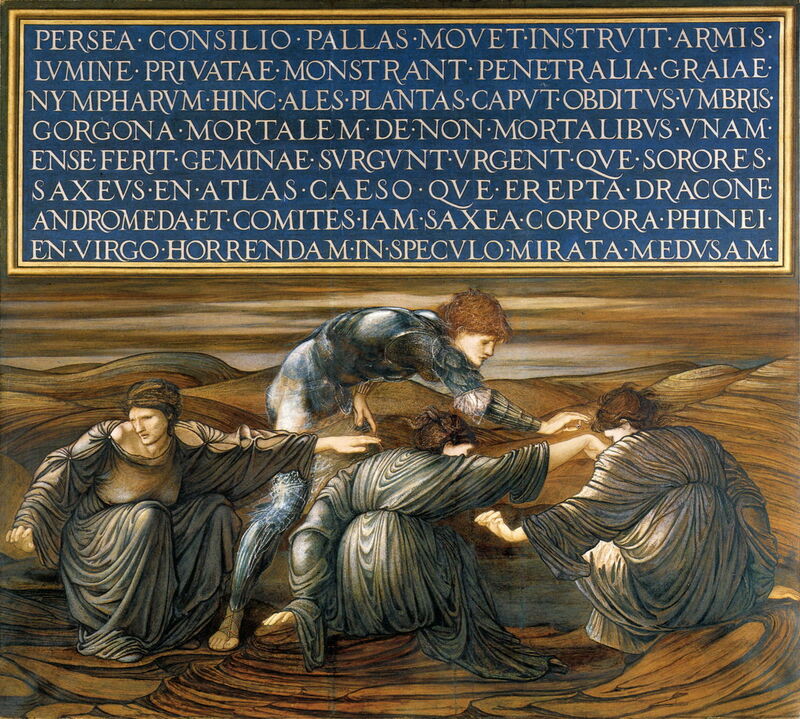 Burne-Jones proposed telling the Greek myth of Perseus in a series of ten scenes: six to be conventional oil paintings, and four to be panels with low-relief works using gesso and carved mahogany. For the latter, he enlisted the involvement of the specialist Osmund Weeks. The myth of Perseus is told in several sources, notably Ovid’s Metamorphoses. He was the son of the god Zeus and the human Danaë. This section of his story starts with a banquet thrown by Polydectes, who had fallen in love with Perseus’ mother. Each guest at the banquet was expected to bring a gift of a horse, but Perseus was unable to, so offered any gift which Polydectes might name; he asked for the head of Medusa. The Gorgons were three fearsome creatures: Medusa was the only mortal among them, her hair consisted of snakes, and her look was sufficient to turn into stone anyone who looked directly at her face. Athena visited Perseus to help him in his mission. She advised him to seek out the Graeae (or Graiae), sisters of the Gorgons: three perpetually old women who shared a single eye, which they passed between them as needed, and a single tooth. As they passed this eye around, Perseus snatched it, and demanded to be led to the Hesperides, from whom he received a bag (kibisis) in which to stow Medusa’s head in safety. Zeus gave Perseus an adamantine sword, and Hades’ helmet to make him invisible; Hermes lent Perseus a pair of winged sandals to enable him to fly; Athena gave him a polished shield to act as a mirror, so that he could view Medusa’s head indirectly. Perseus then went to the cave of the Gorgons, where he found Medusa asleep. Using the shield as a mirror, he cut her head off with the sword. From her neck, she then gave birth to Pegasus, the winged horse, and Chrysaor, a sword of gold. Perseus had donned his helmet to become invisible, so escaped the other two Gorgons, and went to visit Atlas, the king of Mauretania. Atlas refused him hospitality, so Perseus turned him to stone and proceeded to the North African kingdom of Aethiopia. Andromeda, the beautiful daughter of the King and Queen of Aethiopia, was in distress. Her mother, Cassiopeia, was so proud that she boasted that Andromeda was more beautiful than even the Nereids, who often accompanied Poseidon, the god of the sea. The latter decided to punish Cassiopeia for this arrogance, and sent Cetus, a sea monster, to ravage the coast of North Africa including Aethiopia. The king was told by an oracle that the only way to be rid of Cetus was to sacrifice Andromeda to it. She was therefore stripped and chained to a rock on the coast, abandoned to let Cetus devour her. Perseus chanced upon Andromeda in chains, freed her, but kept her there awaiting Cetus. 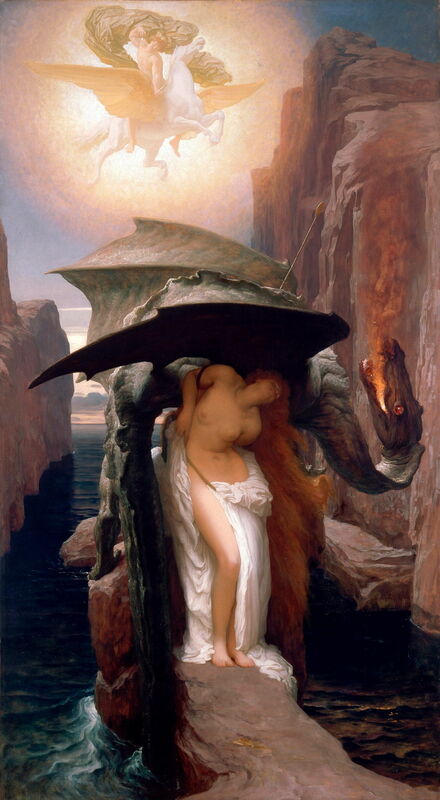 Wearing Hades’ helm of darkness to render him invisible, Perseus killed Cetus, and claimed Andromeda’s hand in marriage. The original Greek accounts do not place Perseus on Pegasus, the winged horse: that addition to the myth developed during the Middle Ages, and was expressed fully in Giovanni Boccaccio’s Genealogia deorum gentilium libri. Various geographers of the day, including Strabo, considered that Andromeda had been chained up at Jaffa, modern Tel Aviv. Various scenes from the myth of Perseus and Andromeda have proved popular subjects for narrative paintings since the Renaissance. Masters who have painted works which survive today include Annibale Carracci (c 1600), Piero di Cosimo (c 1520), Titian (1554-6), Rembrandt (c 1630), Giorgio Vasari (c 1572), and several by Peter Paul Rubens. 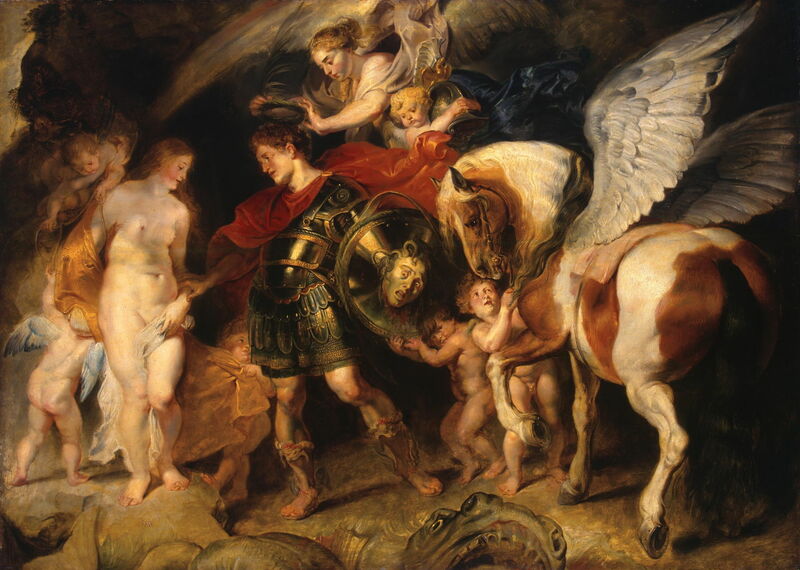 I have chosen one of Rubens’ more developed paintings to illustrate the classical approach. Perseus and Andromeda (c 1622) contains most of the cues and clues to the original narrative. Andromeda is almost naked, although unchained at this stage, on the left. Perseus is clearly in the process of claiming her hand as his reward, for which he is being crowned with laurels, as the victor. He wears winged sandals, and holds the polished shield which still reflects Medusa’s face and snake hair. One of several putti (essential for the forthcoming marriage) holds Hades’ helmet, and much of the right of the painting is taken up by Pegasus (using the revised myth). At the lower edge is the dead Cetus, its fearsome mouth wide open. 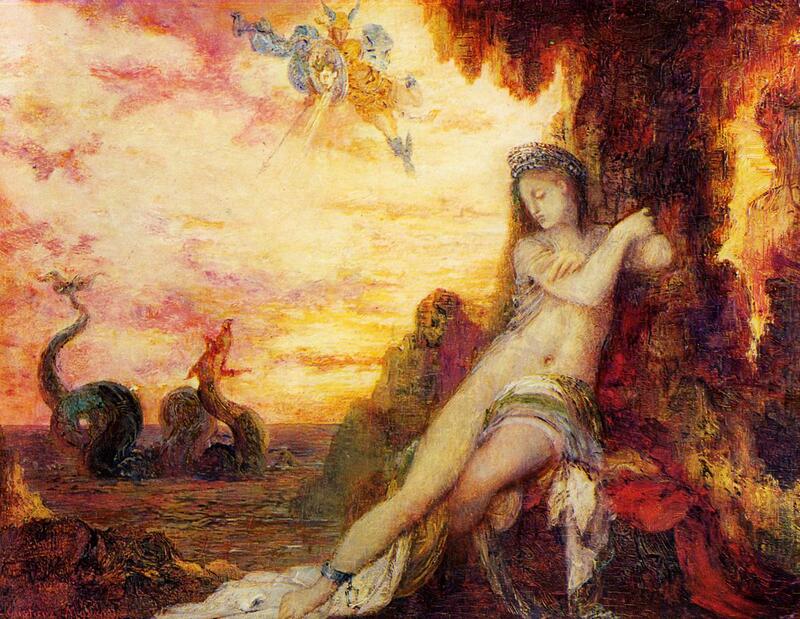 Perseus and Andromeda (1870) puts the shackled Andromeda, almost naked, in the foreground, with Cetus looking surprised at the imminent arrival from the sky of Perseus. He is not astride Pegasus, but wears the winged sandals, and flourishes the polished shield still bearing an image of Medusa’s head. 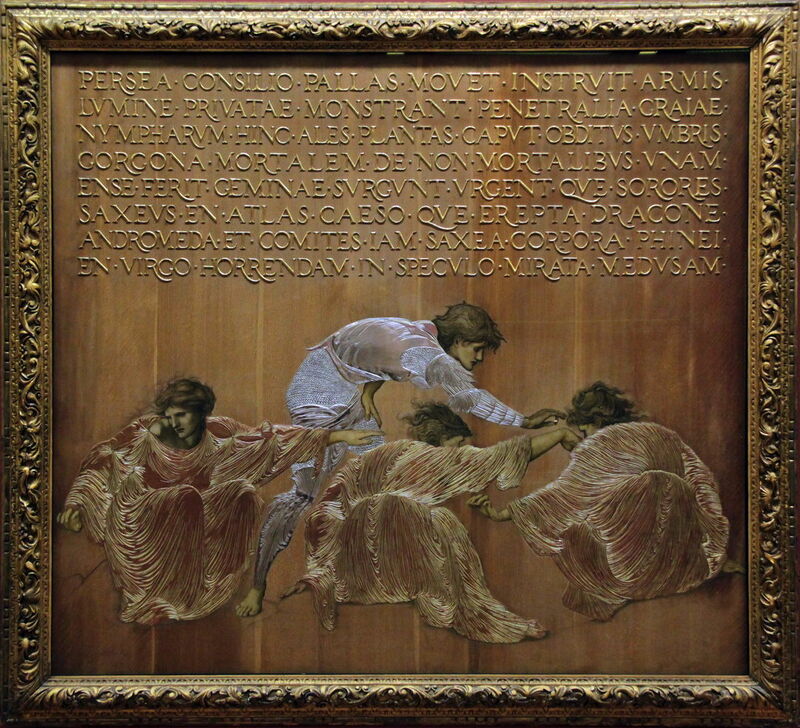 At the time that Burne-Jones was working on this commission, this painting was probably owned by collector Paul Tesse, and it seems unlikely that Burne-Jones would have known of it. Burne-Jones’ own Perseus and Andromeda (1876) may have been an initial exploration of two of the paintings for the series, The Rock of Doom and The Doom Fulfilled. The left half shows Perseus, just arrived at the rock to which Andromeda is chained; the right shows him doing battle with Cetus. This is a fascinating image as far as narrative is concerned, as the two figures appear twice in it, as if Burne-Jones was reverting to the much older technique of compositing multiple images of a story into a single painting. He also used this technique in the first of the Pegasus series proper, The Call of Perseus. After Burne-Jones had apparently abandoned his Perseus series, Frederic, Lord Leighton completed two paintings in which he showed his version: Perseus and Andromeda (1891) and Perseus On Pegasus Hastening To the Rescue of Andromeda (c 1895-6). Adopting the more recent modification to the myth, in which Perseus rides Pegasus, the hero is shown shooting arrows into Cetus while the monster is engulfing Andromeda. His later painting is a reworking of the image of Perseus inset into that earlier canvas, in which the head of Medusa is not in its kibisis but exposed for clarity. 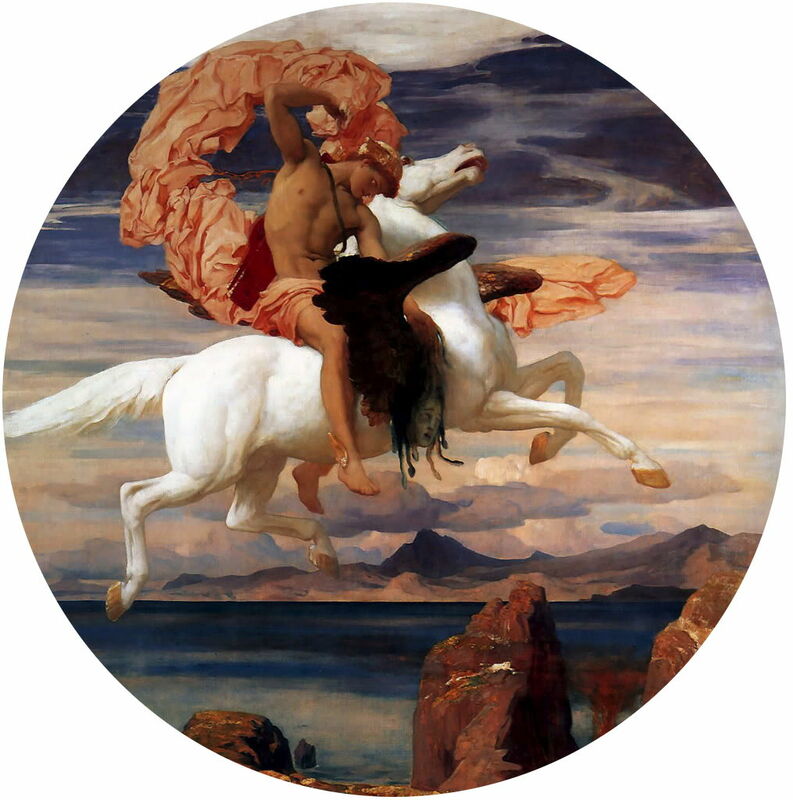 Frederic, Lord Leighton (1830–1896), Perseus On Pegasus Hastening To the Rescue of Andromeda (c 1895-6), oil on canvas, 184 x 189.6 cm, New Walk Museum & Art Gallery, Leicester, England. Wikimedia Commons. The Perseus series contains a text summary, drawn from the Latin of Sir Richard Claverhouse Jebb (1841-1905), a contemporary classical scholar and promoter. However, Burne-Jones was unable to accommodate that in the first of the series, for pictorial reasons which will become obvious in the next article, and had to transfer it to the second, which I show here in its full-size gouache study, then in its finished version as the first of the low-relief panels. Pallas Athena spurred Perseus to action with her urging, and equipped him with arms. The Graiae revealed to him the remote home of the nymphs. From here he went with wings on his feet and with his head shrouded in darkness, and with his sword he struck the one mortal Gorgon, the others being immortal. Her two sisters arose and pursued him. Next he turned Atlas to stone. The sea serpent was slain and Andromeda rescued, and the comrades of Phineas became lumps of rock. Then Andromeda looked in a mirror with wonder at the dreadful Medusa. In the next article I will show how that worked out in the paintings. 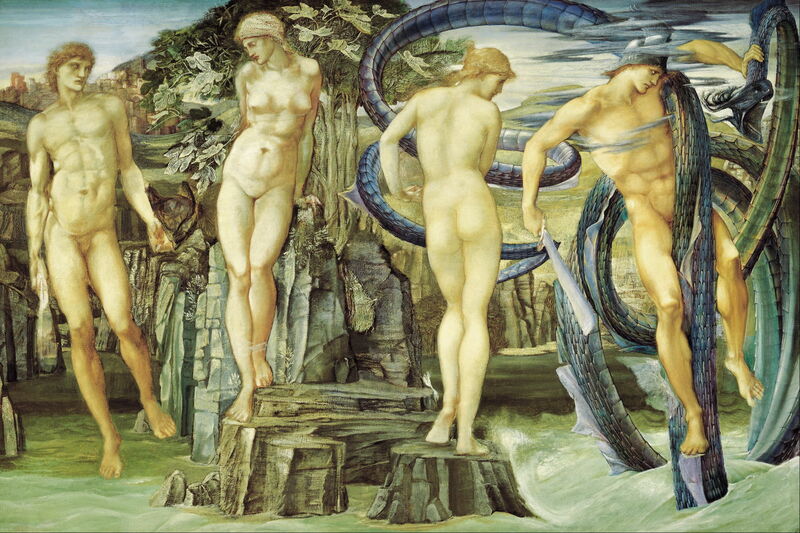 Posted in General, Painting and tagged Andromeda, Burne-Jones, Leighton, Moreau, narrative, painting, Perseus, Rubens. Bookmark the permalink.